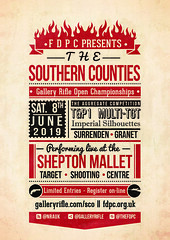 2019 Imperial Competition for Gallery Rifle and Pistol. 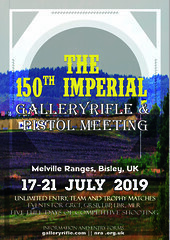 Next July is the 150 years of the Imperial, the GR side has been asked if we as a group would like to do anything for this. I know this will only get to a few people who shoot GR, but the journal, web site and Facebook and word of mouth is all we have at present. Some will have seen the posts, some fairly vociferous about changes we made to this years prize-giving for GR, it did not work as planned. Communication between e-mails and word of mouth produced different opinions and a different result to that envisaged . We learn for next year to cross the T’s and dot the I’s. 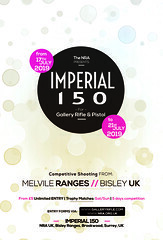 To get some ideas for next year of what we could do that hopefully will involve a lot more GR shooters than the few that normally attend the Imperial we are holding a meeting at the army clubhouse on the Saturday evening of the Nationals at 6.00pm to get ideas. 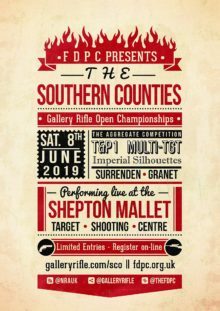 We want ideas for the competitions we could add and days to shoot over, not for just from those that already attend, but to bring more shooters into the event. I also do not want it to be a discussion of prize giving and this years events, we need to work for the future for all GR shooters. If you cannot be there but have any suggestions, send them in to me at ted.george52@gmail.com, and they can be looked at by those there. The GR section of the imperial starts on the 18th July and continues till Sunday inclusive, for those who have been before its a laid back mixture of medal competitions available every day which can be re-entered as many times as you have the ammunition to shoot, and trophy matches which happen on the Saturday and Sunday. The details of what is shot can be found in the GR book and the ‘Bible’ I have attached the range plan for Melville so you have some idea of times and where to go. Look forward to seeing all that can make it there. It is time over the next month to look at the gallery rifle book, a number of people, especially new shooters think the last version was to tasking on the grey cells, trying to decide which end of the book to look at, and some differences in general rules that contradict. I tend to agree from discussions with them. 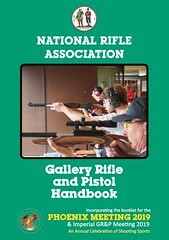 It is a book to cover all gallery rifle with a common set of rules for all the competitions and safety. All courses of fire to be in one section regardless of which of the shoots it takes place in. Record score should be from all registered and approved competitions around the country so they will be National Records. Am sure there will be some that disagree because the book and contents was their ‘baby’ but it has grown been added to over the years and in reality it’s time to have a rethink, the silent majority who have no opinion, and those who have ideas and can be bothered to put into print. The book goes out to clubs around the country and seen by probationary shooters, shooters that are still undecided about what direction to take, these need to be considered. If you have a view, idea, or feel something needs clarification let me know asap. 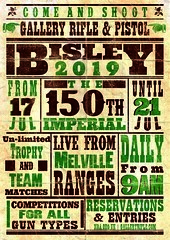 The NRA in conjunction with the Gallery Rifle Community are running a skills development day at Bisley. The day will be split between some theory in the new pavilion training area and on the range. 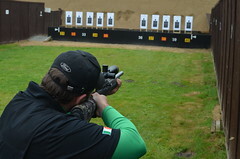 The day is to help those shooting gallery rifles improve and broaden their skills and the techniques of shooting a couple of new disciplines. To all that take the time to visit this site and read this post thank you, at the meeting held with shooters at the ATSC a number of points was made by me ( see the post if you have not read it ) it was agreed that as a lot of people did not visit the web site or use facebook e mails to people to keep them informed was the preferred option, out of the 60 people there I have got 12 e mail addresses back, shows real interest in their chosen sport and discipline. Neil has now passed on a list of job he had opted to take on and look after, having gone through the list and finding some other tasks that it seems belong to me, have put together the following list. I hope people will volunteer and take them on, if not they will probably not happen or only happen when I am bored, have nothing else to do or found out how to do them. 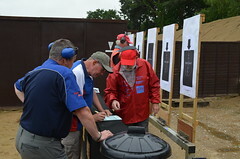 Collating the scores from the matches shot, posting onto web site, reclassifying shooters as required, keeping the classification list up to date for those running shoots and shooters. Look at the classifications and standards for medals and recommend changes. Form a group of people to write articles for the NRA journal and other places that may be interested. Keep IGRF domain and gallery rifle domain up and running, look after the gallery rifle web site to keep it running, facebook page and the Wikipedia page up and running, all the above if routine maintenance I am told. 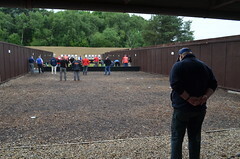 As it appears that all the gallery rifle courses run by the NRA at Bisley falls to me to give them the talk and arrange the instructors. 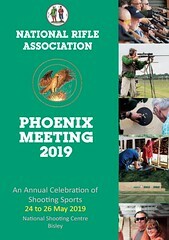 So we need to get a group of people with the time and skills to help novice shooter improve, if we want to improve our importance and raise our profile with the NRA this is a good route. If any of the above tasks tweak your interest let me know, if by the end of October I have no volunteers for these tasks then its 50/50 if they get binned totally or done in some other form. 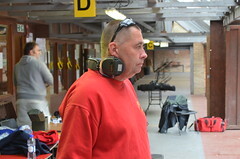 Gallery rifle is your discipline and improving what happens in that discipline is down to all those taking part. It is not a task for one person. People who want to know what is going on and avoid facebook and this web page send me your e mail address so whats happening can be sent out direct and we can keep all informed. Any friend or members of your club that doesn’t look at the site or know of it tell about it and get them to send their e mail. 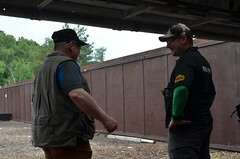 The meeting was conducted by Ted George at 18:40hrs with approximately 60 GR&P shooters in attendance. 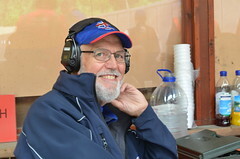 The meeting was started by thanking Neil Francis for his hard work and dedication over the last 6 years as Gallery Rifle and Pistol Rep. His service to the sport and the shooters has benefitted us all and he will be dearly missed. With the spare time he’s to hoping he might actually get a decent score now. After the thanks and applause Ted continued by pointing out that certain functions undertaken by Neil as GR&P Rep. will not be continued. Numerous jobs and tasks had been added to the burden of the Rep position which take it away from its initial and intended purpose. Ted explained that he neither had the time nor wish to take on these additional roles and as such the GR&P community will either have to find a Rep who will, or take on these tasks on a volunteer basis. After discussion it was decided that Ted and Neil will draw up a list of roles and present these to the community to see if any volunteers would take them up. There are a number of things that are not working well at present. 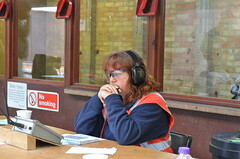 · We do not have enough Range Officers (ROs) to run the shoots at Bisley. Over the last few meetings the situation has grown worse as a number of people have stopped acting as ROs. This has been in part down to the number of RO shooting days being reduced from 2 to 1. Some felt the NRA was not valuing their efforts and simply messing them around. In some cases this led to the NRA making ROs pay for accommodation, despite working. · It is a fact that some people who volunteered as ROs shot their matches and did not work. Certain people did a quick walk down their range, considered it had enough ROs and took the rest of the day off. This is unacceptable. To help the ROs shoot all their matches Ted has spoken with Pete Cotterell about running 2 bays on Melville on a Thursday. This will also be raised at the Shooting Committee meeting. We are currently waiting to see if the NRA Accounting systems allow for this. It’s worth noting that people who shoot on RO days will be put to work on a bay over the weekend. If they do not RO then they do not shoot on RO days, and to enforce this any scores shot be non-complying ROs will not be counted. · The definitions of Accidental Discharge (AD)/Unintentional Shot and, Negligent Discharge (ND) needs further clarification. 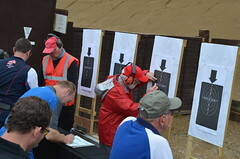 Different opinions among shooters, the ROs and the NRA need to be sorted and for the benefit of everyone involved we need printed quick and easy rules and procedures so the NRA especially, know any incidents have been dealt with in the proper manner. ROs will then be able to recommend training etc. Or in serious cases refer to the Match Director. It is vital all shooters and their equipment are safe before being allowed to continue. · There’s also a question of ‘can people acting as ROs get a copy of the current RCO handbook?’ This needs to be resolved as well, so everyone is on the same page with commands and procedures. 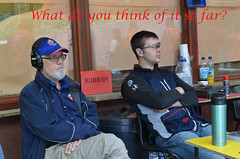 · We need to try and get national bodies to support and help shooters competing in GR&P internationally. A common and transparent selection process for teams has to be made. Those who have an interest or want to have a go need to know how and what to do. As current selection process leaves it open to understandable criticism and rumour, something a robust and transparent system will fix. 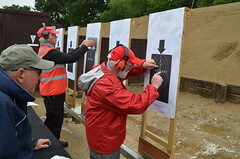 A system like that used by the NRSA has been accepted by Sport GB and following that example we may be able to gain some additional funding to help the aspiring shooters. · Given talk in the meeting about the possible direction of pistol shooting it must be made clear this is a Gallery Rifle and Pistol community. There is a need to promote LBR and LBP to improve their public face and reputation with the Police and Home Office, but this in no way takes away from the Gallery Rifle aspect of the discipline. Both are valuable tools of our sport. · It became apparent that there is a real need to improve communications among ourselves. The GR&P website and it’s Facebook group should both be looked regularly for the latest information. Given the healthy hate of doing either of these it was decided an email would be sent around about specific topics and events. These emails will only be sent round by those requesting it (contact info@49th.co.uk with your details to register). Please sent this post far and wide to all the GR&P shooters you’re in contact with. Get them to register as well because the more the merrier for all of us. 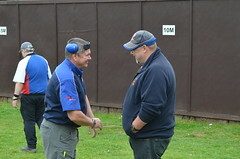 Around 1993 Dave Ballantyne and I set up a 1500 pistol team and a selection/training process with the approval of the NPA, NRA and British Pistol Club (BPC). 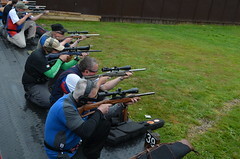 At the time Great Britain was the leader in this discipline outside of America where, other than in a few organised matches, 1500 was accepted as a training shoot and competition for police and security personnel. Other European countries were keen on the discipline, with the Bund der Militär-und Polizeischützen (BDMP) shooting it and Belgium and Czechoslovakia following soon after. 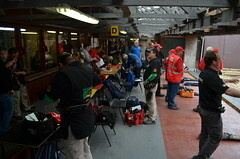 The international competitions ran from 1993 until the loss of pistols and the dissolution of the NPA in 1997-1998. The 1500 was marked down with Bianchi for inclusion in the 2000 Sydney Olympics; a team from GB was selected and funding approved. Sadly, because of the ban, it did not happen. 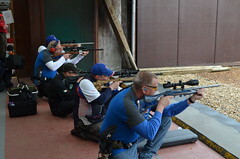 Since then, some of the shooters in the original team who still participate in international competitions have ‘donned the shirt’ and represented the country as a make-up team of best scores at the event.During the period between 1993-1997 the teams that were entered won four team gold medals in the four-man event and two golds, one silver and one bronze in the pairs event. 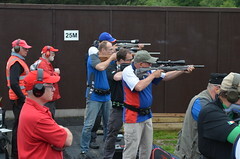 During the last 15 years a World 1500 Association has been formed and the number of countries shooting the associated matches has grown, now including Russia, South Africa, Germany, Belgium, Australia, the USA and Norway. Every two years a World Championship is held in one of the member countries: Sweden this year in August, then Germany in two years’ time. Long-barrelled revolvers can be used for training, with some modifications, and for some events .22 pistols can also be used. Some pistols are stored in Europe for use in the matches if required. Now looks like a good time to revive the 1500 team and give it a more official standing. Speaking as the appointed coach for the team back in 1993, we can achieve scores to challenge the other competing countries and with some training even beat them. 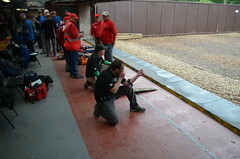 Since the ban on pistols I have worked with various groups shooting 1500 in other European countries, putting together training plans, assessing the individual’s faults and suggesting ways of training them out of the technique. These countries are now putting in good and consistent match grade scores. The training notes I put together have been used by Germany, Sweden and Southern Ireland to good effect. I firmly believe we could put a core team together that would be capable of challenging for the medals at a future World Championship training and team selection. 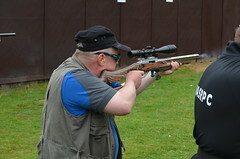 Training would be inclusive to everyone shooting competitively in the UK. 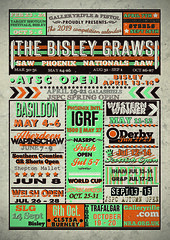 There are numerous competitions around the country including Mattersey, Derby, Basildon and Bristol as well as the Bisley GRAWs including the GR&P National Championships in August. Additionally, and new for 2015, there is a Scottish 1500 championship match to be held in Aberdeen on 2 August. I am proposing that competitors with a Match 5 score above 578 would be able to gain an invitation to join the squad where the coaching team would work with these individuals. Teams at these international WA events are two-person for the revolver matches and semi-auto. We have in the region of 25 people entering competitions in Sweden over the long weekend of 13-16 August. For many this is simply for the pure enjoyment of taking part in international competition. Registered scores from most competing are not high enough to make it into to any sort of GB first team, but we have half a dozen or so that would be suitable candidates for the four spaces available. Can GB compete internationally with in 1500 with the pistol – as they do with the rifle? The GR&P sub-committee will decide a short list of potential members for the first team; criteria for performance in the individual matches at national circuit competitions will be key in making the final selection. The NRA is enthusiastic about the venture and will offer Goodwill Team status should the team apply. 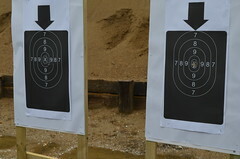 Range space for training is available at a number of ranges, donated to help the formation of a national pistol team. The team would also eventually seek sponsorship to help with the cost. For information about international 1500 competition shooting see the WA website. For more information on 2015 World Championships the World Championships website. We have considered these, and agree. 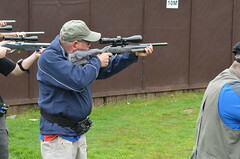 For clubs in the north and east it is time-consuming and costly to send people to Bisley to do an instructors’ course. There are no technique courses – it’s like being lost in a maze. None of this is good for the sport. We have put together a group of instructor-run courses around the country for clubs and groups. The courses will be run as cheaply as possible just to cover expenses – all we need is a venue capable of setting up a screen and projector, seating for those taking part, and a range to put theory into practice. This should make it economical for clubs to get some quality basic instructors. In time we plan on running technique courses for pistol and gallery rifle – it is now 17 years since we lost pistols and with national teams running once more, we need to teach shooters the skills of shooting these again. Revolver & Pistol Techniques – stance; grip; sights; aiming; trigger release; breathing; follow through. Black powder; Techniques for different disciplines. How people learn. Instruction techniques – Involve the person/ people; break the section down into small segments with practical sessions; teach, don’t indoctrinate, think of a course you have been on that you enjoyed; tell them how you want the task carried out and not how not to do it, give positive feedback to build confidence. What affects how a person performs – A bad journey to the session, problems at work, problems at home, alcohol, eating before the session (blood is then used to digest food and robs the brain of oxygen). The person needs to concentrate on the shot being fired, not what has gone or what is to come. 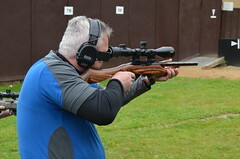 The course will also promote physical relaxation; mental relaxation; visualisation; mental rehearsal; keeping positive shooting records; and a positive attitude. The course can be tailored to suit individual needs. If you have any questions ask, we want to get more people involved in the sport. 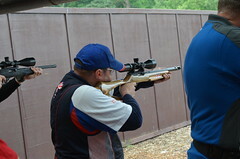 The Gallery Rifle and Pistol Discipline is sending a team to Sweden for the 1500 World Championships in August. If all goes well then approval from the NRA trustees for an official team for future international competitions will follow. As it stands we have applied for NRA ‘Goodwill’ status for the 2015 Sweden tour and see no reason for it to be declined. 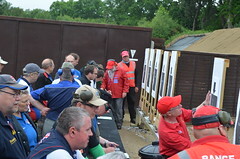 England has also decided to form a team/squad for home countries and international competitions, following talks with shooters from Wales and Scotland they have also indicated interest. These are normally 2 person teams; one for revolver one for pistol. 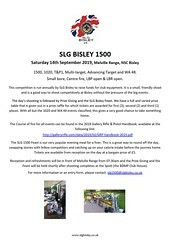 1500 match 5 and T&P1, Multi target are shot in Europe and ideal for International matches and Home Countries Competitions run as head to head and possibly as a postal through the winter months as training. In this country it will be with LBR and LBP. Abroad with standard pistols and revolvers, although abroad it is iron sights only in the competitions. Practice in this country and scores for consideration will need to be with the same. I suggest we use the NSRA system for selection as it has been accepted by Sport England and GB and hence receives some funding for the teams. 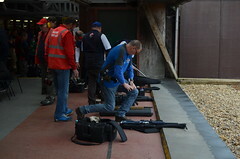 It is not complicated, a simple form filled in by the shooter indicating interest, handed in at a nominated shoot and that with the score achieved sent to the Home Countries captain, coach and GB captain and coach. If an entry level score has been achieved or close to, then the person is invited to attend a training session with the squad and see if they want to become part of the squad. We could devise our own system but using something established makes more sense. People can apply to either Home Country or GB details of the person will be exchanged between them. GB team will be selected from best match scores, training scores and consistency in training. Bear in mind membership of appropriate Home Countries or national Governing Body membership will also be required in most cases if the process is initiated. 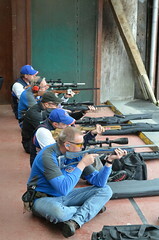 To shoot for an official GB team an individual membership of the NRA is required for example. A suggest format for the form is shown below. 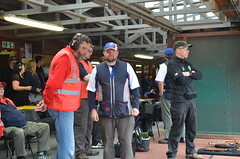 Initially it is unlikely any will be available but once teams are established and have a ‘track record’ it is possible to apply to the relevant body for some funding as do the GB pistol team now. Suggested entry level scores are below. If anyone is consistently achieving these scores get in touch. Ranking tables, Historic scores databases and Highest Achieved Scores are available on this website to refresh your memory of achieved scores.